The most famous of Switzerland’s mountains is the Matterhorn located above the village of Zermatt. To see this majestic peak is a must for every first time visitor of Switzerland - when spotting the Matterhorn, you will get excited by its incredible beauty. Zermatt is a car-free resort and despite being an international world-class resort, has not lost its authenticity. Zermatt is situated in the Valais, in the south-west of Switzerland, bordering Italy and France, and one of Switzerland’s main tourism regions. Several other popular destinations are located in the Valais - in the Rhone Valley as well as in its numerous side-valleys. Many of these mountain resorts are well known for skiing, especially Verbier which features numerous black runs and off-piste sikiing. However, these villages also have plenty of sports and leisure activities to offer during the summer months: mountain climbing, hiking or biking..... and the resort of Crans Montana which lies on a sunny plateau facing south with great views of the peaks of the southern Alps, is well known for its golf course. Popular destinations in the west and south-west of Switzerland include several cities lining the northern shores of Lake Geneva. Well known, of course, Geneva with its international organisations, but also offering many interesting sites within the city and in its surroundings. Further, Geneva with its international airport Geneva-Cointrin often serves as the starting point for touring Switzerland. Lausanne is another city on the shores of Lake Geneva and is surrounded by rolling hills covered with vineyards. This area is famous all over Europe for its tasty white wines, and the Lavaux vineyards have been named a UNESCO World Cultural Heritage Site. 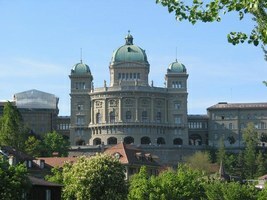 Lausanne also is known as the home of the IOC, the International Olympic Commitee, including its Olympic Museum. On the eastern shores you will find Montreux, a charming resort town, which besides the historic architecture, the picturesque lanes, historical sights and exclusive shopping facilities is well known for its numerous international festivals such as the Montreux Jazz Festival in July. The Montreux region enjoys a mild, almost Mediterranean climate and a visit of the famous Chillon Castle is one of the "Musts" when visiting Switzerland. Bordering this French speaking part of Switzerland is the appealing countryside of the Bernese Oberland with its many spectacular peaks of the Bernese Alps and several popular mountain resorts. In the western part of the Bernese Oberland lies Gstaad, a glittering resort with a high-roller status, but offering a variety of attractions, events and activities to every visitor. In the center of the Bernese Oberland is Interlaken: this town is the starting point for numerous excursions to the mountains of the Jungfrau region, as well as on the two lakes, Lake Thun and Lake Brienz. 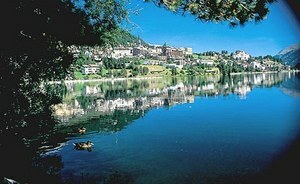 Interlaken offers great views of the Bernese Alps, especially the Eiger, Moench and Jungfrau mountains. 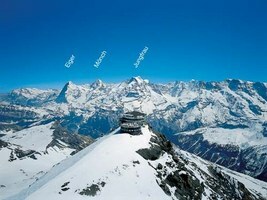 Even closer to these famous peaks are the mountain resorts of Grindelwald, Wengen and Muerren. The glacier village of Grindelwald, on the foot of the Eiger North Face, already has attracted foreign visitors in the 17th century, and still today enjoys the reputation of a resort with an international atmosphere while having kept the old charm. Wengen is situated on a sunny terrace above the Lauterbrunnen Valley. It only can be reached by train - either from Grindelwald, or faster from Lauterbrunnen. The resort is well known for hosting the "Lauberhorn Downhill Skiing Competition" in January, and for the mountain railway which gets tourists all the way up to 3,454 m (11,330 ft) at the Jungfraujoch which is also referred to as the "Top of Europe" (since it features the highest railway station in Europe). Muerren is located opposite Wengen on the other side of the Lauterbrunnen Valley, also on a sunny terrace and the village can only be reached by gondola. It offers magnificient views of the peaks of the Bernese Alps, and the gondola gets skiers, hikers and other visitors up to the Schilthorn mountain with its "Piz Gloria", world's first revolving restaurant which attained fame through James Bond's "On Her Majesty's Secret Service". The Medevial town of Thun situated on the northern shores of Lake Thun is the gate to the Bernese Oberland. It offers several interestings sights such as the impressive castle and numerous activities including watersports. In addition, this town is perfectly located for making daily excursions in the surrounding hills, to the Simmental and to the Bernese Alps. Central Switzerland is referred to as the country's birthplace. There are numerous small villages and resorts worth a visit in this part of Switzerland - either along the shores of Lake Lucerne or in the surrounding valleys and mountains. Most foreign travelers visit Lucerne, the lovely city situated on the northern end of Lake Lucerne where the Reuss River resumes its course. Located in the historic and scenic heart of Switzerland, with picture mountains, lakes, cowbells, Alpine villages and meadows full of Edelweiss, Lucerne often is considered the "true Switzerland". In addition to the many attractions and sights within city limits, Lucerne also serves as an excellent base for excursions such as to nearby Mt. Pilatus offering fantastic views of the city and the lake, the mountain resort Engelberg with Mt. Titlis which is known for its revolving gondola, or heading south through the Gotthard Tunnel to the Ticino, the Italian speaking part of Switzerland. The Ticino is Switzerland’s southernmost region and quite different from the rest of the country. Italian is the main language spoken and also the atmosphere is very Italian. The areas around its two lakes, Lago di Lugano and Lago Maggiore, enjoy a distinct Mediterranean climate where palms and citrus trees grow, where figs, olives and vineyards are cultivated, and other tropical vegetation flourishes. Lugano is the Ticino's best known city and Switzerland's 3rd largest financial place as well as a popular holiday destination for many Swiss escaping the northern climate. Ascona and Locarno are lake-side resort towns situated on the shores of Lago Maggiore; both offer the Mediterranean atmosphere and plenty of options for excursions on the lake or the surrounding hills, for pleasant walks among gardens and along the shores, and other summerlike activities as early as in March. Also bordering Italy as well as Austria is Graubunden. This region in the south-eastern corner of Switzerland is an excellent destination for activities of all kinds and the panoramas, the deep valleys and the blue l akes are breathtaking. The Engadin Valley enjoys a special atmosphere and a dry, tingling champagne climate with 322 sunshine days yearly, and therefore, several villages have beome popular tourist destinations, especially St. Moritz which stands for a chic, vibrant and elegant town, second home to the rich and famous. Originally known for its healing mineral springs, St. Moritz today is one of the world's most famous ski resorts also offering numerous yearly events and plenty of activities during the summer months, and thus, also for non-skiers a highlight on any Swiss itinerary. Davos is another health resort in Graubunden which has become a popular destination for snow sports. This town also is known for hosting the World Economic Forum and offers a variety of sports and leisure activities all year. Eastern Switzerland - north of Graubunden along the Rhine River to Lake Constance is known for the Appenzellerland with its gently rolling green hills, flowery meadows and rugged mountains. Tourists seeking culture and customs come to this region to discover the immense wealth of tradition of painting, music and cheese-making. The main city of Eastern Switzerland is St. Gallen with its famous cathedral and abbey which has been named a World Cultural Heritage Site. St. Gallen's picturesque Old Town, and the rural charm of the Appenzellerland with its numerous outdoor activities including an excursion to the peak of the Saentis to enjoy magnificient views, are always worth a stop-over. Furthermore, Liechtenstein, with its Capital Vaduz is situated just across the Rhine River. Further along the Rhine River, bordering Germany from Lake Constance to Basel where the river leaves Switzerland stretches the Northern Switzerland region which mainly consists of the greater Zurich Area and the greater Basel Area. Zurich Switzerland's largest city, famous for its banks and shops on the "Bahnhofstrasse", but also home of superb museums and art galleries. The city offers a wealth of history, architecture and culture and Lake Zurich provides for many activities in and on the water. With its international airport Zurich-Kloten, Zurich is the starting point of many tours of Switzerland, or the city serves as a hub for daily excursions to most popular Swiss sights including the Alps. Basel, situated in the 3 countries corner of Germany, France and Switzerland, is an international transport hub and trade center. The city is an open and tolerant metropolis and often called the cultural capital of Switzerland offering the highest density of museums and galleries. 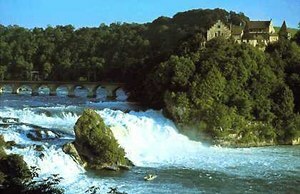 These two cities certainly are the main attractions in Northern Switzerland, however, also the countryside offers several interesting places such as the Rhine Falls, Europe largest waterfall near the city of Schaffhausen, Augusta Raurica, the Old Roman town near Basel. The territory from the greater Zurich Area in the north-east to the Lake Geneva Region in the south-west is called the Swiss Mittelland (or Middleland). This region is most important with respect to agriculture, industry and transportation, but is not geared as much to tourism as other Swiss regions. 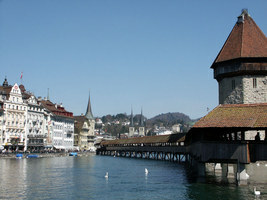 However, there are numerous interesting sites including Bern (or Berne), the Swiss Capital. The medevial Old Town which has been named a UNESCO World Cultural Heritage Site offers plenty of historic places to visit as well as shopping arcades. With its central location within the country, Bern serves as an excellent base for daily excursions in any direction - to the Bernese Alps or to the Emmental region to visit a cheese factory. Located just 30 minutes west of Bern, the small Medevial town of Murten is worth a stay. The Old Town with its castle and the ringwall has been well preserved and looks the same as at the time of the War with Charles the Bold who was defeated in the Battle of Murten in 1476. The Jura mountain range stretches from Lake Geneva in the south to Basel in the north forming the Swiss border with France. This region, also known as "Watch Valley" because it was a major center in the watchmaking industry, offers a variety of tourist activities including hiking, cycling and (cross-country) skiing. Attractions include natural features such as the "Creux du Van" rock or the "Taubenloch" gorge, and the towns of Le Locle and La Chaux-de-Fonds, both situated rather high in the mountains and both have now been recognised as an UNESCO World Heritage Site for their horological and related cultural past. 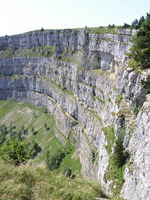 Neuchatel is another watchmaker town, situated in the Jura foothills on the shores of Lake Neuchatel. This town offers an attractive Old Town with steep alleys, several excellent museums, and plenty of options for leisure activities in the city, in and on the water, as well as in the mountains.